It is that time once again, to tear something up, make a big mess and then make it better. When we moved in our stairs were carpeted with teal carpet. I am not sure I told you the house was done in teal and mauve. Well it didn't take long for the carpet to come off. We were originally hoping to be able to refinish the stairs, but they were not made with good wood to paint or stain. So we started researching totally replacing. My BIL to the rescue again, he works in the flooring industry and while we were in Kentucky over Thanksgiving we picked up the tile for the bathroom and risers and treads for the stairs. The first thing was to completely tear out all of the stairs. Although our fridge is built in under the stairs on the opposite side there was still a lot of wasted space under the stairs. 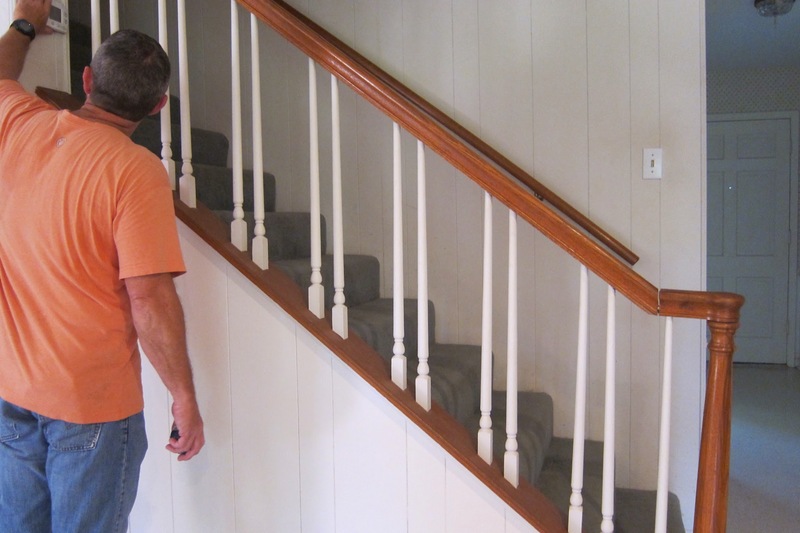 We couldn't figure out a way to make better use of it, but we did place insulation in there to deaden the sound of walking up the stairs and to buffer noise from the den to the dining room. After insulation, then we started cutting treads. Wonderful cut and measured each one, and although they were pretty consistent, it did vary a bit. So the extra time and effort it took to measure and cut each one individually was worth the it! The risers were the same, measure and cut each one individually. This project actually moved pretty quickly and was easily finished in a day. 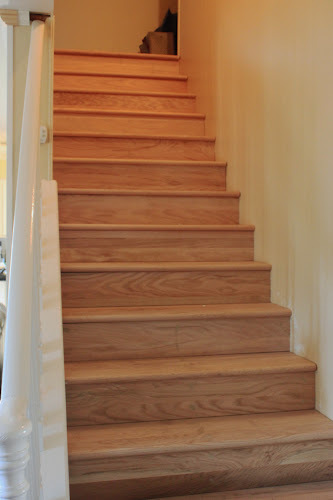 When Wonderful was finished, there were a couple of creaky stairs, he was going to try to fix them, but both Darling Daughter and I asked him to leave them. A few creaks has so much more charm than non-creaky. I know that would drive some people crazy, but I love it! 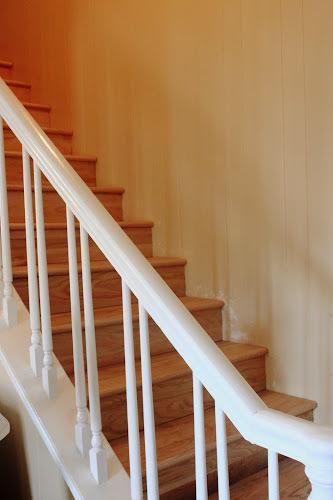 Because of the damage and color of the oak stair rail, we had already decided to paint it all my favorite glossy white. I can't wait to see it all completed. I am not sharing Friday projects in real time. This project was completed on the Friday before we were having the staff party on Sunday. Cutting it close I know! I had pictures all along the way, but I lost a whole memory card of pictures for projects we have been working on. Frustrating!!!!!!!!!! !